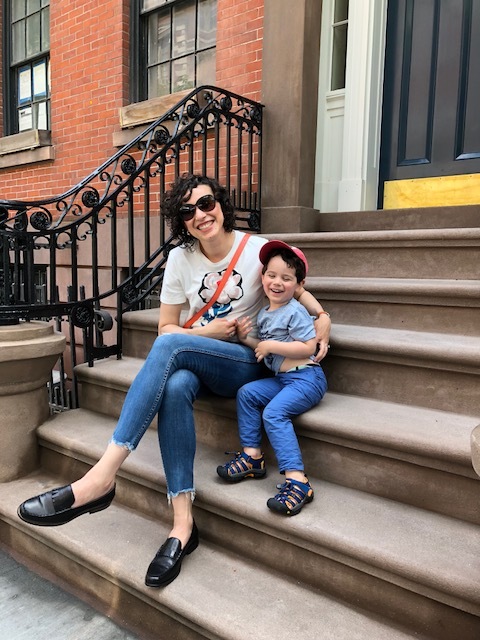 Life is so funny sometimes and I could never imagine that living in NYC, being a full-time mom, and having a blog would be my life today. It’s basically what I dreamed of, but it was something so far away. I can’t complain, I’m super grateful for everything. Last Wednesday I was lucky enough to be invited to go to the MomTrends Night Out with Parents Magazine, Parents Latina, and a bunch of great brands I love. If you follow me on Instagram you probably saw pictures and videos on my stories. The evening was full of laughter, food, cocktails, massage for mamas, and good connection for everyone. The event happened at the Meredith Corporation in downtown Manhattan and the brands that were part of the event were Culturelle, Boiron, Vtech, and JCPenny. Needless to say, all great brands that I’m very familiar with. Culturelle was something I always had with me since D was a tiny baby. His pediatricians recommended Culturelle Baby Probiotics – A line of probiotic products created to help build a strong foundation for your baby’s healthy growth and development – and because I knew already about the product and trust her, I used until Dylan completed 12 months. At the event, Culturelle Baby Probiotics had such a sweet station where we could pick our own baby bag and fill up with products we would use. It brought some really sweet memories seeing all those baby things. I promise I’ll have another post with more details about the brand and whole experience. Boiron has a line of homeopathic products and I absolutely love it. When I found out they were one of the brands part of the event I was so excited! I use the Oscillococcinum quite often for me and for Dylan. Any, any tiny sign of cold we use it. I don’t know if I got lucky or what, but that thing works really well. They have cold calm and cough syrup for kids and carry that everywhere we travel. They had a station where we could prepare our own smoothies, decorating, and make being healthy throughout the cold season more fun. Vtech has some amazing toys and it’s a beloved brand by all. My favorite thing to see was the camera for kids that I’m definitely adding to Dylan’s Christmas list. The camera is basically “fall on the ground or anywhere” proof, haha. And that’s what I need!!! Vtech was kind enough to send each one of us home with a karaoke machine for kids. First I was planning on giving to Dylan next morning, but talking to my husband we decided that will be better to save for Christmas and have fun when family is in town. VTech is a world leader in developing high-quality, innovative educational products that enrich children’s development and make learning fun! This year’s Holiday Gift Guide is full of fun learning toys that kids and moms alike will love! Vtech also had a relaxing lounge where all the mamas could get a little massage when seeing the toys. Of course I was one of the first in line!! And last but not least, JCPenney is excited to announce the launch of our new lifestyle brand: Peyton & Parker! The brand is designed entirely by our in-house Design Team at JCPenney and sold exclusively in our stores and online. Peyton & Parker is a collection of classic women, men, kids and home looks that mix & match to create effortless, yet put-together style for the family. Looks for the whole family that are modern and understated—it’s style that tells a rich, personal story. The pieces are classic and versatile; it’s every Moms dream come true. Peyton & Parker is about fresh, approachable trends that work for her family’s lifestyle, no matter the occasion. Peyton & Parker captures those transcendent family moments we cherish and hold dear, with the idea that everything really is better when it involves family. Here is the look I created. Starting October 19, shop the new Peyton & Parker Collection is available exclusively at JCPenney in select stores and on jcp.com/peyton-parker. I Cannot wait!! It was so especial to be part of this event and all this just got me super excited for Christmas time and winter. I actually want snow right now. Thank you, MomTrends, Parents Magazine, and Parents Latina for inviting me.